He was the last great hero of his generation. Velma Martinez - Velveteen - had never intended to be a great hero, but she was out of choices. "Hello, Jolly Roger." "Hello, bunny-eared girl who's taken over my ship. Have you come to collect the bounty on my head?" "I've come because Dame Fortuna told me how to find you, and we need your help." Velveteen crossed her arms. "The Super Patriots are corrupt, and I think Marketing is evil, and they have my best friend, and we want her back." Jolly Roger blinked, several times, before turning to the Princess. "Is she for real?" "She is," said the Princess, sounding smug. "She would have been happy stayin' out of the way for her entire life, but The Super Patriots forgot the first rule of rabbits. Don't follow them into their dens. They're meaner than they look." Velma hadn't wanted to be a superhero, had walked away from it all once before. But when love and friendship call Velveteen to fight, she can't run away, no matter the odds. Award-winning author Seanan McGuire chronicles Velveteen's ultimate battle in this concluding (for now!) volume of her adventures. ©2013 Seanan McGuire (P)2013 Audible Inc. Imagine a world where instead of Hollywood, the Kardashians, Real Housewives, and the Bachelor, you had The Super Patriots. And The Super Patriots had the world's best marketing division. And it's always on. Velveteen’s world looks and functions exactly like ours, except their celebrities are superhumans – and the marketing division decides the vantage points of good and evil. As you can imagine, anyone not with them must be against them – but when 95% of the world’s operational superheroes are with them… being against them gets a little tricky. Velveteen is a superhuman whose focus has always been on the human, rather than the super. She wants the world to reflect that back at her. I do, too. She is a heroine I could have met on the subway yesterday. When Seanan McGuire started writing Velveteen shorts, I don't think she expected her "silly superhero stories" to resonate so soundly with the world we live in, to tell a truth so firmly and make us laugh until we cry with poignancy and wit. I haven’t listened with a book without stopping for a long time but, I powered through Velveteen (clocking in at twelve and half hours) in almost exactly two days. That should tell you something about Velveteen and the enrapturing world she takes you to. This is the second book in the Velveteen Vs. series. Velveteen Vs. started as a series of stories posted on McGuire’s blog; these books are compilations of those stories. I really enjoyed this humorous yet heart-felt continuation of the Velveteen stories. I listened to this on audiobook and the audiobook was very well done. The narrator does an awesome job and I would recommend listening to on audiobook if you like audiobooks. A lot happens in this book and it was great to finally see Velveteen face off with the Super Patriots. I Loved it! Velveteen is just such a “real” feeling character; I love reading about both her day to day struggles and the awesome superhero stuff she does. I actually pretty much love every single character in this book. McGurie has a way of making even the bad guys interesting and making you engage and sympathize with them. My only comment would be to remember that this is more of a collection of stories than a continuous novel. It actually makes a pretty good novel but things can get a bit repetitive because McGuire will kind of explain the basics of Velveteen’s character at the beginning of each “story”. Things end at a pretty good point, although it looks like Velveteen will potentially be having some more adventures with the Seasons in future installments. Overall I loved this book even more than the first one. The characters, world, and action are awesome. I would recommend to urban fantasy fans, McGuire fans, and fans of superhero stories. Loved Vel! Seanan has done it again. I am a Seanan McGuire Fan. Her writing gets me every time. She really Duda great job with this super hero story for me. What did you love best about Velveteen vs. the Multiverse? I love the story and the performance overall. Seanan McGuire is awesome! 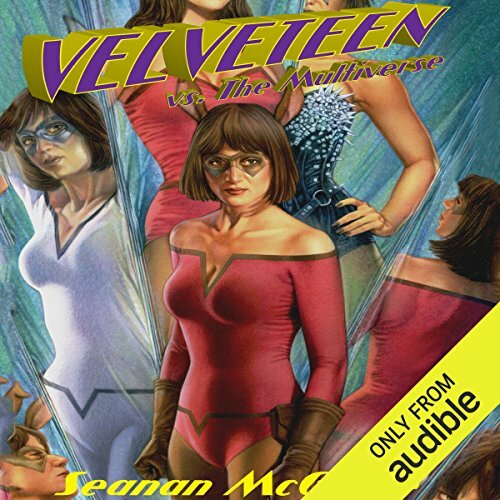 What other book might you compare Velveteen vs. the Multiverse to and why? Hero by Perry Moore - because they're both stories about the protagonist as underdog hero and the heroes are the villains. The vocal performance was excellent, overall, but there were points towards the end where the male voice characterizations were a little blurry. I totally loved the voice artist's characterizations of Velveteen, Princess, Jacquiline (Jackee? Jacqui? Jacki?) Frost, Victoriana, and Polychrome. I was telling my friends on facebook about Victoriana and Polychrome (Polly Chrome?). Not as good as the first but still worth reading. Would you try another book from Seanan McGuire and/or Allison McLemore? It felt incomplete though I understood the reasoning. The concept was still engaging enough. There were a couple of instances where the logic failed which always grates on me. You would think that in fantasy one would be more open to random illogic but not for me. You pick the rules but you gotta play by them consistently. I love reluctant hero's and its rare to find a female one at that. The first book was made up of short stories and read as a bunch of short stories. This second book however has the feel of a novel and after finishing it I am looking forward to another one. This book is easy to get into and well thought out. A total joy. Seanan never fails to deliver great stories, interesting complex characters and a fun read with any of her work. Velveteen is a wonderful example of this. This installment is even better than the last. With the great writing, emphasis on character development, world development and humor this is quickly becoming one of my favorite series much less just a great addition to the super hero genre. I can't wait to see what comes next. This is one of the most unique stories I've ever listened to. I wish it wasn't over!